Subgenres are not always born completely out of musical styles. Some develop from other spheres outside of the realm of music and take their style and influences from different environments. In the case of Vaporwave the genre would find its nascence in the incubator that is the internet, spawning from the message boards of Reddit and 4Chan. The genre is characterised as much by its visual aesthetics as it is it’s musical components. 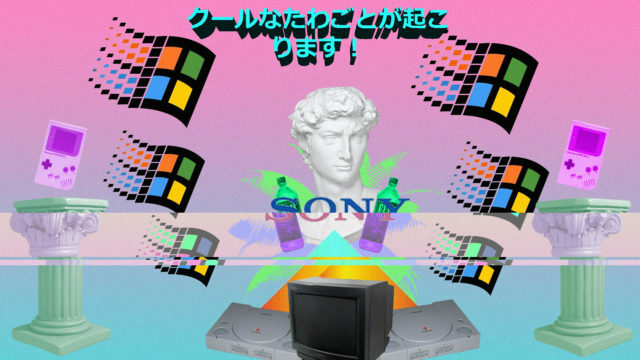 Emerging at the beginning of the 2010’s, Vaporwave takes much of its visual style from early nineties technology, popular culture and consumer capitalism. These are heavily represented in the videos accompanying the tracks online as well as the artwork surrounding the releases. Often the appropriation of the above elements are presented ironically in an almost surrealist fashion. Late nineties web design, glitch art and even old clips of The Simpsons are used to create an aesthetic of warped fetishised nostalgia. Taking many queues from the Chillwave genre, Vaporwave employs a similar use of airy synthesizer pads and programmed percussion. To expose its uniqueness, musically the genre shares a lot of similar concepts to the visual side. There is a heavy reliance on sampling with audio clips from old TV shows, corporate muzak and smooth jazz used to reinforce the ironic, early nineties nostalgia. Production wise the music and samples are often slowed down to slower BPM’s or chopped & screwed to create a surreal warping effect, reflecting a similar aesthetic to the visual elements of the genre. While the genre itself was fairly short lived it did inspire other style offshoots including mallsoft, futurefunk and hardvapor. (The latter of which is also another surreal rabbit hole worth exploring). Take a look and have a listen below to the weird world of Vaporwave.